Musings of an enthusiastic reader. Rendezvous with Rama by Arthur C. Clarke is a reread for me. First published in 1973 this novel is considered a classic work of hard science fiction. Though flawed, this book is one of the most plausible science fiction novels about first contact with an alien civilization ever written. Clarke’s vision is set in the 2130s when humanity has moved out into the solar system. Various planets and moons are colonized. Travel between various objects in the solar system takes often takes months and is accomplished in sub – light speed spaceships. The universe that Clarke has set up is believable and is based on real scientific and technological principles. A fast moving object, first believed to be a large asteroid, is detected moving though that solar system. Astronomers name the object Rama. Robotic probes soon discover that Rama is no asteroid, but is instead a fifty - mile long cylindrical object that was obviously constructed by an alien civilization. Due to the fact that Rama is moving so quickly and will soon exit the solar system, only one ship, The Endeavor, Commanded by Bill Norton is able to make a rendezvous. The narrative involves Norton and his crew’s exploration of the enormous interior of Rama. The explorers find that Rama is filled of strange and intriguing phenomena and creatures. There is no violence, little romantic interaction, and minimal action to this story. There is some suspense as the crew finds itself in various dangerous situations that develop both inside and outside of Rama. Despite the minimal drama, as a chronicle of exploration and wonders, this book is a minor masterpiece. There is something to be said about this novel’s simplicity. This book’s strength lies in its extremely realistic vision of future space travel, as well as a first contact with an alien civilization. Clarke’s universe, where humans have colonized the Solar System is scientifically literate, technically accurate and credible. First contacts with alien type of stories are by definition extremely speculative. Yet these events are presented in a believable way here. Silliness or cringe worthy passages that are so typical in this genre are absent from this book. This work, alongside Carl Sagan’s Contact, are the best fictional accounts of first contact that I have read. This novel is extremely imaginative and describes a place filled with wonders. It is a mirror to the unrealistic as well as the post – modernist science fiction and fantasy that is fairly popular these days. I am not criticizing those less realistic forms of storytelling, however I think realistic stories are also important and worthy. Furthermore, unlike so much unrealistic speculative fiction, the characters in this book act intelligently, and are scientifically and technically literate. "Ten meters away was a slender-legged tripod surmounted by a spherical body no larger than a soccer ball. Set around the body were three large, expressionless eyes, apparently giving 360 degrees of vision, and trailing beneath it were three whiplike tendrils. The creature was not quite as tall as a man and looked far too fragile to be dangerous. .... It reminded Norton of nothing so much as a three-legged spider or daddy longlegs, and he wondered how it had solved the problem— never attempted by any creature on Earth— of tripedal locomotion." Norton’s speculations about tripod’s biology emphasize the scientific thinking that characterizes the book. Though written over forty years ago, in terms basics of science and technology, this book has held up amazingly well. Of course Clarke missed some things, such as the utility and ubiquity of mobile devices. However, much of the universe that the author created here still stands up to scrutiny. This novel is not without flaws however. The characters are terribly underdeveloped. What is particularly frustrating is that as the backgrounds of the characters are presented, many of their attributes and relationships are fascinating and beg for further development. When characters are introduced the reader is given tantalizing details about them that never appear again. For instance, as the backgrounds of several characters are described, it is revealed that polygamous marriages for both sexes have become common. Several of the characters are initially described as being in such relationships along with some interesting twists. Unfortunately Clarke fails to develop these narrative threads. We often hear that such lack of character development is characteristic of science fiction of this era. However, I would point to many other books and television series, such as Larry Niven’s Ringworld, Frank Herbert’s Dune, Robert Silverberg’s Dying Inside, to name just a few science fiction books written around this time, that included interesting and sometimes complex characters. There is also a common idea found in online reviews of this book, that the stripped down characters are part of this novel’s strength. The reasoning is that the spare character development allowed Clarke to create a lean story focused upon the wonders of discovery. I concede that there may be some truth to this assertion. However, Clarke sets up such interesting scenarios that it is shame he does not develop them. This book can be categorized as optimistic science fiction. Clarke’s future is one where humanity has survived and thrived. Though common at the time that this book was written, such stories of bright futures are a bit out of fashion these days. Dark visions of humankind’s future, while always popular to some extent, seem to be much more popular as of late. Once again, I am not knocking these pessimistic stories; humankind is facing threats that may be fatal to our civilization. Fiction is inevitably grappling with those dangers. Yet the possibility of a bright future where humankind “makes it”, is in my opinion, still a very real possibility. However, my speculations on these matters are for another blog post. I should note that there exist sequels to this book. They were written years after the original and involved other authors collaborating with Clarke. I have not read any of them. The reviews for these books are generally negative. Though flawed and lacking in some ways, this work is a fantastic story of exploration. It reflects one of the best speculations about what an encounter with an alien civilization will be like. In its depiction of this encounter, Clarke has a lot to say about the Universe, Human Beings, our history and our civilization. For folks who enjoy such stories and speculations, this book is highly recommended. Brian, your excellent review reminds me of a curious thing: human fascination with extraterrestrial life forms. I wonder if those forms exist but have my doubts. I suspect man-made but self-generating A/Is will be the true "extraterrestrials" and our undoing. What do you think? BTW, I have read only one by Clarke: 2001. It was better than the film. I'm not a regular sci fi reader, but this one does sound very imaginative! Excellent review! It is one of my favorite works by Clarke, and the weak characterization is a problem. I would have liked to have learned more about some of the characterizations and about the society. However, the depiction of the alien ship is fascinating sufficiently to overcome those underdeveloped aspects and make it a truly classic SF work. I do believe that there are life forms elsewhere, many probably are sentient, but I doubt very much that we will ever meet, considering the size of the universe and that there are billions of galaxies and each has millions, if not billions of stars. And many will have planets in orbit, as we are discovering today. I've read other work by Arthur C. Clarke, but haven't read this novel. It sounds imaginative yet plausible, and positive as well. I will keep this book in mind. Excellent commentary, Brian Joseph! I read this back in my 20's along with most of Clarke's other books. I liked it but tried to read one of the later sequels recently and found it pretty dire. Clarke was very good at plausible technology but, as you rightly said, not so good with people. Niven was better - at both! It still deserves to be regarded as a classic though - despite its flaws. I think that it's practically certain that alien life is out there somewhere. How much of it is intelligent? Now that's a whole other question. Intelligence seems an evolutionary 'slam dunk' only up until now and (mostly) from our point of view. It could be a dead end - literally. But that would mean our odds of meeting another race would be approaching zero. Personally I think that any aliens we actually meet - the intelligent ones anyway - are more likely to be machines than organic. Thanks Tim - I have read some serious speculations about Alien Intelligence from writers like Carl Sagan and David Grinspoon. Even among the smart and methodical thinkers, there is no certainty either way. Thus I am not sure. It is truly intriguing subject though. I agree that machine intelligence is coming. It might be humankind's undoing. I highly recommend Nick Bostrom's Superintelligence for some educated guesses as to what is coming. Hi Harvee - This is as classic as classic science fiction gets. Thus I think that it would be a good introduction to the genre. The Universe is indeed immense. Who knows what is out there. If we discover something, it will likely be though radio waves. Evan that would be a Earth shattering discovery. Thanks Suko. If you liked Clarke's other books you will probably like this. Hi CyberKitten - I agree that the Universe probably has a lot of non - intelligent life in it. I found David Grinspoon's Lonely Planets to be an up to date and very worthy speculation on the possibility of intelligent life. I have a couple of books on Life in the Universe that I need to dig out - but so many books so little time & all that! I agree about the sequels. They were not of the same quality. I finished the second one, but gave up on the third. I think there's a fourth, but I have no interest in reading it. Agreed. The discovery of life forms out there would have an immense effect on us, even on those who will deny it. It sounds quite fascinating to me -- but is there really not much action in it? It seems a book of exploration -- where Norton & his crew come upon such creatures. I'm glad it's an optimistic viewpoint without violence on either side. How rare these days. Did Clarke continue to believe humanity thrived ? Hi Brian, really fine review. Your description makes me want to read Rama. I haven't read much science fiction in my life and I kniw I'm missing out. Arthur C Ckark is one of the giants in the field and though characterization is important for me in a novel, I'm also interested in a book that tackles i teresting ideas, like what first contact would be like. Interesting review, Brian. I'm trying to remember if I've read Clarke. I know his name; probably read a short story in an anthology. I have not read Herbert or Niven, although my husband has, so I can't say whether their characters are developed but I have to agree with the critics that my main gripe with sci fi is that the characters are rather thin. I think this is mostly because the main thrust of the author's intent is to develop their alternate reality and their "what ifs". One could also argue that classical lit has pretty simple story lines because they are character driven-although I know there are great exceptions. Hi Fred - Indeed, some would deny it! Hi Susan - The action is minimal. I mostly followed Clarke throughout his life. I would say that he stayed mostly optimistic. Hi Sharon- I think that you are on to something. Often science fiction is light on characters in order to emphasize the science and storyline. That is the case with this book. Often, other kinds of books are strong on character and but light on story. Of course there are lots of exceptions. Thanks Kathy. This book is a good introduction to science fiction if you can get past the weak characterization. It is one of the best first contact books out there. Excellent review - I read his short story, "The Sentinel" (also full of wondrous descriptions) but don't remember reading much else of his, and I like that he tries to make it realistic. Also, good point about the prevalence of darker visions for humanity these days... it's one of the reasons I started watching Star Trek TNG a while ago - sure, even they have their ethical lapses and darkness and Picard would caution against complacency, but it's still a vision that's much more optimistic than what one usually reads/watches. Happy Fourth of July! Great review of one of my favorite writers. Although I've not read this novel Clarke's writing style has always impressed me. I'm sure that it would overcome any flaws in character development your mention so I should put this on my to read list. The Sentinel was a great read. This book as well as Childhood's End, are in my opinion, well worth the read if you want to give him a try. I also love Star Trek for its positive view of the future. It may be our last optimistic- future, mass media mythology that is still popular. I agree that human intelligence is a product of evolution. Daniel C. Dennett explored this in all sorts of ways in From Bacteria to Bach and Back. It is also an intelligence that arose to handle survival and reproduction in a tough world full of competition. Thus in may not be the best mechanism to understand the mysteries of the Universe, consciousness etc. On the other hand, Dennett and others have pointed out how flexible it is. Kind of like a supercomputer that can take all kinds of software. You raise another interesting problem. That is, as part of the Universe, can we ever really understand it? Perhaps in the flexibility of our minds, or the minds of artificial intelligences that we create, we can achieve some kind of understanding. I think that you would really like this book. Tanks The Reader's Tales. This would be a good book to try science fiction. OUTSTANDING review as usual, Brian! This is a very cogent analysis of this book. You have a very objective viewpoint, which is one of the things I enjoy about your reviews! I really should try "Rendezvous with Rama", though, in spite of your criticisms of it. It sounds like a very imaginative look at our future. Besides, I MUCH prefer optimistic SF to dark visions of future dystopias. BTW, you must have heard that the movie "Blade Runner" now has a sequel. It's titled "Blade Runner: 2049". As I HATED the original, I definitely won't be watching this one! On a brighter note....If you have not yet seen "Wonder Woman", I HIGHLY recommend this movie!! It's already earned well over $700 million, worldwide!! The acting, cinematography, and plot are all TOTALLY AWESOME!! And it's a pretty optimistic movie, as well! Childhood's End had a darkness to it that this book does not. I think that you will really like this one. It does have certain similarities to Star Trek. I have heard about The Blade Runner Sequel. I am a fan of the original. However I understand why you would not like the pessimism. I must see Wonder Woman soon! I just know that I would like it. I went back to work today after four days off so I know how you feel! Great review, Brian. I've heard the name Clarke a million times but until recently I had a tendency to skip science fiction, especially "hard science fiction" but "optimistic science fiction" sounds good. I feel like we live in the age of dystopia right now. Thanks Delia. We are indeed in the age of dystopia! Clarke was in many ways a great science fiction writer. I also recommend his Childhood's End. That book is less optimistic however. This sounds like something I should read. I am a huge science fiction fan. Can not believe I have somehow missed this one until now! Thanks for stopping by Sandi. Clarke is well worth reading. I also highly recommend his Childhood's End. I admire the imagination writers have for good sci fi! Hi Harvee- Clarke was one of the most imaginative yet he was realistic. sounds Brilliant work of scientific fiction with little flaw of poor characterization. i like about the story most is it's optimistic aspect which is biggest need of time . Since beginning humans history has both sides of the picture black and White ,along which we see grey existing too . I believe that no matter how advanced the universe will be ,humans will possibly not be able to run away from his all features of his nature . I though will not be able to see that era when man will meet his neighbors and choose other planets to live so reading this wonderful review it gave me glimpse of that time and i say thank you for this kindness Brain! Thanks Baili - I also believe that when it comes to many aspects of life, a mix of optimism and pessimism works best. Unfortunately er will not likely see the type of space travel depicted in this book in our lifetimes. However, the scientific and technical wonders that we are seeing in are lifetime are wondrous. 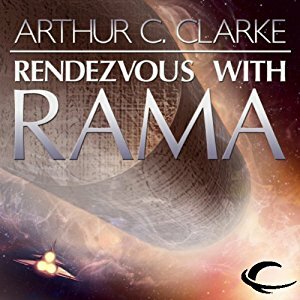 I have never heard of Rendezvous with Rama, it does sound creative. It's interesting reading about what it would be like to encounter alien lifeforms. Hi Naida - Clarke was one of the most creative writers out there. I highly recommend this one.